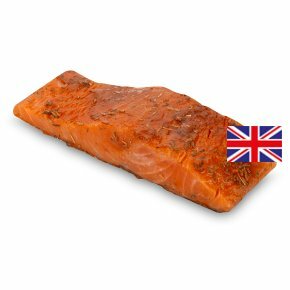 INGREDIENTS: salmon (Salmo salar) (fish) (98%), sugar, maize maltodextrin, garlic powder, maize starch, yeast extract, citric acid, rosemary, maize dextrose, salt, flavourings, colour (paprika extract), parsley. Grill Time: 10-12 mins. Grilling Instructions: Preheat grill. Remove all packaging. Place salmon fillets under a medium grill. Turn half way through cooking. Pan Fry. Time: 10-12 mins. Remove all packaging. Heat a little oil in a frying pan over a medium heat. Pan fry fillets for 5-6 minutes each side until cooked.